... is a series of fantasy novels for adults and young adults about a young woman, called Ro, and her family who are exiled from their remote community. The first two novels in the series, Discord's Child and Discord's Apprentice, are available as ebooks from Amazon and Smashwords. Check out this page, my blog or on Goodreads for updates and extracts, and news of contests and offers. The Exiles of Ondd have their own pages on Facebook and Twitter with quotes, news and all things relating to their world at @ExilesofOndd. Trouble was coming–the elements weren't where they should be, a baby was born deaf and then there was Ro. The Vitae-hearer drew the flower from her healing bag. "No wood-stars should flower in this season–it's beautiful, but it doesn't belong. Ro, nothing can survive where it does not belong." And Ro has never fitted in. 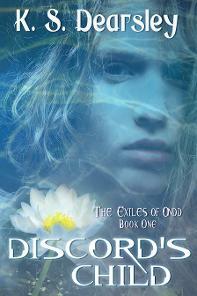 Born without the ability to feel the elements as everyone else in her village does, she creates discord. Now her niece has been born deaf and she is blamed. Exiled before she can do more harm, Ro and her family set out for Najarind city in search of a cure, but discord follows them. Accused of murder, hunted and betrayed, they find themselves entangled in the eternal struggle between the Dragon and the Worm. If legends are to be believed, only Ro and a baby stand between the world and destruction. 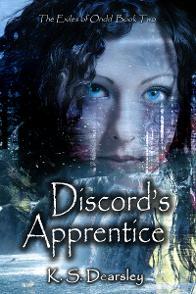 Now includes chapter one of Discord's Apprentice. The only way she can keep those she loves safe is to find the Dragon and wake it. King Channan controls Najarind once more, and Ro thinks that she and her fellow exiles can rest, but as guests from all over the Empire gather to celebrate the naming of the heir, she makes a disturbing discovery. The forces that would plunge the world into chaos are regrouping, and a storm is gathering about her. Can she find the Dragon before they do? She sets out on a search that will test her will and courage, and lead her ever deeper into danger. Where are you going my little one? There's no harm in delay. Who knows what fate awaits you? So rest awhile and stay. What are they without a name? Come, join us in the dance! We wish to share our joy. Our old fears are forgotten. And help us share our joy. You in my heart and I in yours. Which path will lead to what you seek? How will you find the way? We ran fast as the river. As we rest our bones beside the fire. Dance to the rhythm of the pipe and gong. Dance to the music of the hearers' song. Where skies are green and grass is blue. Where lobsters bleat and fishes moo. And yet it might be true. With all her heart and that it's you. Please tell me that it's true. Where once we shared our love. Or feel your touch once more. And know your love lives on. Down the stairs and through the halls. Things good folk never had before. They had told him it was true. But once begun it ran and ran. 'Though now we know that it's absurd. The rain was soft on my face. The day began so well. By noon the day had darkened. Rain drummed on my shoulders. Afraid that I would follow. As I looked for his return. But look! The clouds are parting. Steam rises from the land. As he wades back to me. Away all you who'd have me go! I'm weary of the struggle. And rest awhile in peace. Hurry up now, they won't wait. Last one has to guard the door. Yet we don't lack for company. Bouquets whose blooms dispel vast night. And rocks us safe 'til morning pales. Where we must say good-bye. We never can see eye to eye? We really are a perfect pair. Wherever one went, the other was sure to be found. Two sides of a coin, but not doubles. Pretty and clever and good. Peace is in a field of flowers. To scatter on your pillow. To bind around your brow. Of peace, and flowers and you. And hope Ondd's wings will speed you home. Are you the one I'm searching for? Who'll shelter me from harm? But you were with me all along. His bones are the bones of the earth. We feel his breath against our cheeks. His blood meanders through the land. His fire makes the world revolve. His vitae lives in everything. But no two are the same. A new life is beginning. There never was another horse like Flame. But best of all a willing heart. Whate'er I asked, he'd do. I knew that we would win. Let's raise a glass and remember our friends. So raise your glass and remember. We'll tell new comrades of their exploits. Just as we used to when we were young. Take the first letter from each answer to make up the name of a character from Discord's Child. The answers can be found by scrolling to the bottom of the page. The following is a series of lyrics originally intended to head each chapter of Discord's Child. Time and life move onward. Not even the stone stands still. And sink when youth is gone. Wherever the path may lead. And hearts full of spite. But the cage we place about our hearts. Shelter me. Be my home. Green protector, hear my plea! I stretch my limbs and whisper to the wild woods. In Great Kabonn I yearn to roam. What do you see when you're up in the sky? What do you think floating there every day? Like a flood it bears all before it. A thread that binds and never breaks. Part mother from child? Part sister from sister? As well ask the sun to sleep at noon. Feel the rhythm of Its breath rock you. This thing that I must do. I'll manage it with you. My foolish errand here with you. Bleak as endless winter was the Worm. The bones of the earth felt the pain of its passing. Earth will sigh and air will churn. And the people wept for what was lost. Fire will freeze and ice will burn. Banishing foul Lethir's lesser kindred. Vitae death to life can turn. There is a place in my heart that is empty. It waits for hope to fill it. Hope that I will be freed from chains undeserved. Tell me, how much does nothing weigh? My handsome one, my darling? And will not lose him lightly. You will not see her crying. And have no thought of dying. Sealing your smile with gold. Sleep softly, you are loved. The slope stepped to the summit. What once was, or what is? With skin of waving grasslands. Desired as a dream, I see you from afar. Long have I loved you. Passions unrequited burn the heart. Fires rekindled burn more bright. It started with a small seed. The helpful plant grew to a weed. Broke the trust that planted it. Its lies become monsters, grow and breed. "I will slay the beasts for you!" His sword was in her hand. And you are the evening. Shall our swords sing of life and death? Is no concern of mine. Is all a point of view. Answers to the name quiz. The initial letters spell: Fordel–one of the lords of Najarind, who has a bigger part to play in the intrigues at court than he would have wished.